The James P. Wilmot Cancer Center is the first multidisciplinary academic cancer center in the Rochester community. 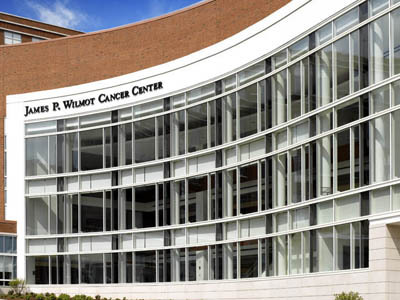 Affiliated with The University of Rochester Medical Center (abbreviated URMC), the Wilmot Cancer Center consolidates all outpatient cancer care services and research programs into a single, accessible location. The Wilmot Cancer Center is also home to the Comprehensive Breast Care Center, dedicated to a multidisciplinary approach to diagnosing and treating breast cancers. This model, which is unique in Upstate New York, will allow a person who discovers a lump to have an immediate appointment, with imaging and biopsy in one visit. All members of the breast care team -surgeons, radiation and medical oncologists, diagnostic radiologists, pathologists, and nurses- are on-site and available to discuss treatment options if a malignancy is found. James P. Wilmot was a prominent Rochester businessman and philanthropist who originally created the foundation of the center in 1980 to train physicians in cancer research and treatment. There is a quarterly publication, Dialogue, which is sent by mail, free, to potential and past contributors. It has a donation envelope included, and much information about the Center. The expansion of the Wilmot Cancer Center is one of the primary goals of the University of Rochester's Meliora Challenge fundraising campaign.